The stated capacity of these batteries is 2000mAh. - Duracell Recharge Ultra AA batteries are our #1 longest-lasting per charge (for rechargeable AA size, per charge in same device) - Duracell Recharge Ultra batteries stay charged for up to 12 months - Unused Duracell Recharge Ultra batteries are guaranteed to last 5 years - Duracell Recharge Ultra batteries come pre-charged, ready to use - Duracell Recharge Ultra batteries can be recharged up to 400 times - Ideal for wireless video game controllers, baby toys, wireless electronics and more - They are available in AA, AAA, C, D and 9V sizes Duracell Recharge Ultra AA batteries are our #1 longest-lasting per charge (for rechargeable AA size, per charge in same device) and let you charge 400 times. With a Long-Life Ion Core you get amazing power in every battery. Plus, they come pre-charged so you can power your devices right away and will stay charged for up to 12 months, when not in use. 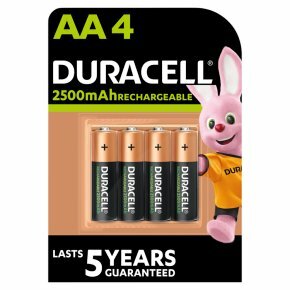 Additionally, unused Duracell Recharge Ultra batteries are guaranteed to last 5 years. These powerful NiMH batteries work in any NiMH charger. With a longer-lasting charge and fewer recharges, Duracell Recharge Ultra AA batteries really do set themselves apart from the rest. Caution: Do not disassemble or dispose of in fire. Check for correct polarity (+/-). Never mix NiMH batteries with any other type of battery. For NiMH designed chargers only. DURACELL battery chargers recommended.